It makes me sad when old houses are stripped of their detail. Not only is the craftsmanship amazing, the old growth trees that were harvested for all of our pretty ornamentation are long gone. I know a lot of people don’t share my opinion, but old houses are such a finite resource, I wish people would think twice before ripping the insides out. Sometimes there are little clues here and there as to who created all that fantastic work. For the past week, I’ve been salvaging as much as I can from a gut renovation in my neighborhood. Among the items I have been able to divert from the dumpster are 3 fireplace mantels (one in good condition, one which has been severely altered, and one that is basically just one broken piece. All three have the same stamp in the back: Killian Brothers. (I’m trying not to think about the fact that all the fireplaces were intact until they were ripped out – think of my happy place, think of my happy place). Anyway, a quick Google search reveals that they were prolific cabinet makers and furniture makers. The Goulding’s New York City directory for 1877 lists two Kilians (Theo and William) who were in the furniture business and shared the same business address: 159 W 32nd Street. Did they make the mantels? Did I find the correct Kilians? 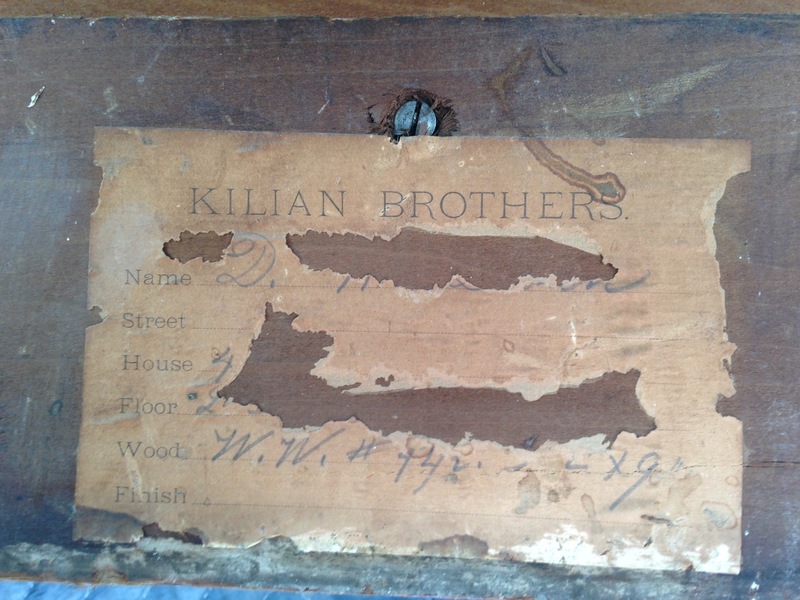 Kilian Brothers furniture turns up at auction on occasion. It seems they were really into the Eastlake aesthetic of the late Victorian period. Google it – some really amazing stuff. Whether the Kilians from my broken fireplace mantels are the same Kilians of the fancy furniture is almost beside the point; there was someone who actually made all this stuff – not a fully automated machine that packs saw dust into some semblance of wood. Now, if you still must get rid of all the things that make your house unique and interesting, then please give me a call and let me take your treasures. Just came across this while doing some research on Kilian Brothers. I would love to see photographs of the mantels if you have them, and photos of the other labels! I’m curious about what you did with the mantels, too. You have my email, get in touch if you’d like! PreviousI totally have a plan and I’m going to – LOOK! SHINY THINGS!